Before we say anything else about Alabama, Oregon, Florida State, and Ohio State, the four teams selected for college football’s inaugural playoff, let’s dispense with any notion that the process for filling out the field should have been, could have been, or was ever going to be fair. A few broken eggs have to be sacrificed to the omelet. For years, playoff skeptics argued that selecting four teams (or six, or eight, or whatever the number turned out to be) would prove every bit as arbitrary and contentious as selecting only two in the BCS era, and hoo boy, were they right. Of course they were. Entering the final weekend, it was clear enough that barring multiple, major upsets (which failed to occur), a four-team bracket couldn’t possibly accommodate all the deserving teams, and that determining which squads would make the cut over other, equally deserving outfits would come down to an exercise in high-handed hairsplitting. And so it did. Every answer was made up on the fly and destined to infuriate as many people as it satisfied. C’est la vie. So, yes, newly minted Big 12 cochampions/playoff rejects Baylor and TCU are both eminently worthy contenders that were just screwed out of an opportunity to play for the national title by infinitesimal margins based on murky, subjective criteria that the committee chair himself doesn’t seem to entirely grasp. But what did you expect? Had the committee chosen the Bears or Horned Frogs at the expense of the Buckeyes or Seminoles, the subsequent confusion and umbrage would have reached the same fever pitch and likely exceeded it. By its nature, the system ensured there would be no definitively right answers for the same reason that tempers flare every March over the candidates vying to be no. 68 in the basketball field. “Controversy” is baked right in. Actually, I take that back: In this case, there were only right answers. Whatever their merits — and they’re considerable — arguments on behalf of Baylor and TCU don’t infringe on the worthiness of Alabama, Oregon, FSU, or Ohio State. The question isn’t “Why them?” because the case for each of the teams that made the cut is obvious enough; it’s “Why not us, too?” for which there will never be a satisfactory answer no matter how many teams are eventually tacked on to the field. (If you didn’t think expansion from four teams to six or eight or beyond was inevitable before, the combination of enthusiasm and consternation that’s greeted the first year of the process should put the question to bed. Bigger is better, and sooner than later.) In the meantime, the best we could have hoped for was a process that managed not to forsake all of the viable options to somehow get the final four glaringly, appallingly wrong. This time, at least, it didn’t. So thank god for the playoff. Thank god it arrived when it did, sparing America from a truly idiotic melodrama over whether 12-1 Alabama or 12-1 Oregon should have gotten the shaft while the other advanced to face undefeated Florida State. Regardless of what you think of the outcome, thank god that Baylor, TCU, and Ohio State got the full accounting they deserved in the room where an actual decision was made, instead of being exiled to a purgatorial on-deck circle by a Rube Goldberg machine with no fail-safe. The annual imbroglios that defined the BCS era were always frustrating; now, they seem like barely comprehensible artifacts from a simpler, stupider time. The playoff has already given us so much more. In place of a narrowly defined debate that relied on random upsets to generate intrigue, the final month of this season delivered consequential games on a weekly basis in every major conference even absent a single earthshaking surprise. Eight teams made it to the final weekend with at least quasi-realistic playoff hopes intact, and they took the field in six games with direct playoff ramifications knowing they couldn’t survive a loss. By late Saturday night, the Crimson Tide, Ducks, and Seminoles had all effectively clinched their places in the bracket, and the suspense was only beginning to reach a fever pitch. The debate over the final spot consumed Twitter, talking heads, and coaches alike, right up until the formal unveiling of the bracket on Sunday. Nothing about Ohio State’s ascension into the final four felt like a foregone conclusion. After the Buckeyes’ eye-opening, 59-0 obliteration of Wisconsin, though, it’s hardly wishful thinking to imagine that with this field, the best is yet to come. As chaotic as this season seemed to be circa early–to-mid-October, the four teams left with seats now that the music has stopped are the same four teams Vegas pegged this spring as the most likely to make the playoff and that went on to claim four of the top five spots in the preseason AP poll.1 In some contexts, that might seem less like an interesting coincidence than an anticlimactic, self-fulfilling prophecy, which is certainly the sentiment right now along Texas’s I-35 corridor. But it was fun, and it was weird. Just like it was always going to be. • Alabama is Alabama. The 2014 edition hasn’t always looked as insurmountable as its championship forebears in 2011 and 2012, especially on the offensive line. But the basic Bama gestalt under Nick Saban hasn’t changed: After stuffing Missouri’s offense in a sack on Saturday, the Crimson Tide rank among the top five scoring defenses in the nation for the sixth year in a row. Offensively, Alabama is on pace to set a Saban-era record for total offense, thanks to Blake Sims’s maturation at quarterback, Amari Cooper’s ongoing excellence at wide receiver, and, yes, Lane Kiffin’s legitimately valuable contributions as the chief playcaller. Who isn’t a little choked up by the prospect of watching such universally beloved figures as Saban and Kiffin share the championship stage? • Marcus Mariota is the Truth. I’m not entirely convinced that Oregon is a great team top to bottom, although the defense was certainly a revelation in Friday night’s win over Arizona (more on that below). But the Ducks have a great quarterback, and they don’t suffer from any deficiencies so glaring that Mariota can’t transcend them. In the Pac-12 championship game, the soon-to-be Heisman winner turned in arguably his worst game of the season on paper, which still yielded 346 yards of total offense, five touchdowns, zero turnovers, and a 150.1 pass efficiency rating in a 51-13 romp over a top-10 opponent. Oregon has eclipsed 500 yards in 10 of its 12 wins and scored at least 42 points in all but one … so, you know, Oregon as usual. 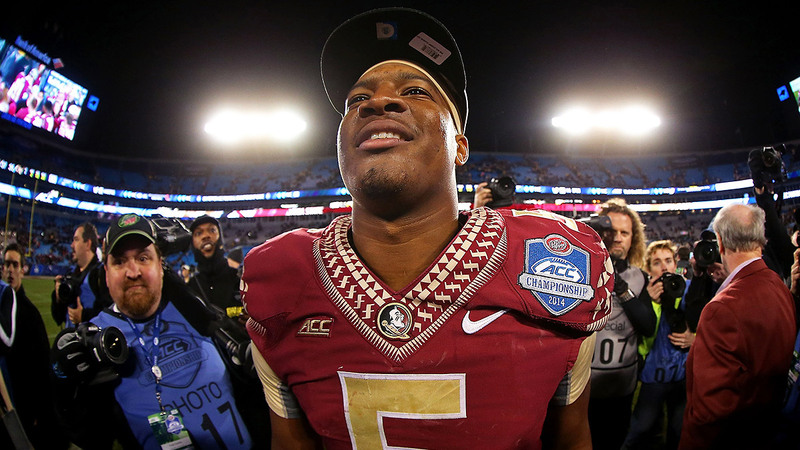 • Florida State is king of the wild cards. The defending champs haven’t played a single game this season that left anyone thinking, There’s a team clicking on all cylinders right now, including Saturday’s 37-35 win over Georgia Tech to clinch the ACC championship. Quite the opposite: The Seminoles have repeatedly escaped scares from lesser opponents by the skin of their teeth, earning their underachiever merit badge multiple times over. At no point have they looked like a playoff team from one week to the next. Still, the results are impossible to ignore: That FSU is here and undefeated anyway is a testament to its tremendous talent and resilience. (And to a little luck, of course, but everyone needs a friendly bounce or two along the way.) Of the final four, the Noles seem the most likely to get run off the field by first-rate competition; they also boast arguably the highest ceiling if they arrive healthy and in sync. If we haven’t seen their best game yet — and there’s a very real possibility we haven’t — then the final, triumphant round in a season-long rope-a-dope routine is still well within the realm of possibility. • Ohio State is … kind of terrifying, actually. I don’t know what Ohio State is going to look like on January 1, after a three-week layoff — 24 days is a long time for jets to cool — but the Buckeyes need to figure out how to bottle whatever came out of the vein they tapped against Wisconsin. Mercy, what a massacre. Remember where this team was in September? Two weeks into the season, Ohio State had already lost Braxton Miller, its face-of-the-program quarterback, and nearly been bounced from the polls following a 35-21 flop against unranked Virginia Tech; a conference championship looked like a long shot, and a playoff berth wasn’t even a consideration. Only a month ago, OSU still resided well outside of the committee’s weekly top 10, behind the likes of Arizona State, Notre Dame, and Nebraska. A month from now, who knows? At this rate, third-string quarterback Cardale Jones will be adding his name alongside Miller’s and J.T. 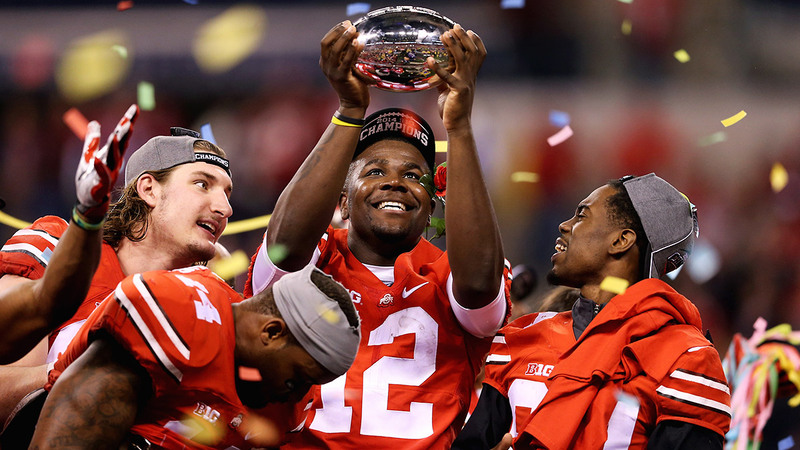 Barrett’s on 2015 Heisman lists and the rest of the Buckeyes will rival the Cleveland Browns. Baylor coach Art Briles, championship trophy in hand, spent part of the aftermath of his team’s 38-27 win over no. 9 Kansas State confronting Big 12 commissioner Bob Bowlsby over the conference’s weird, wishy-washy approach to endorsing a regular-season champion. This is the league that markets itself under the slogan “One True Champion,” after all, and decorum notwithstanding, Briles had a point. 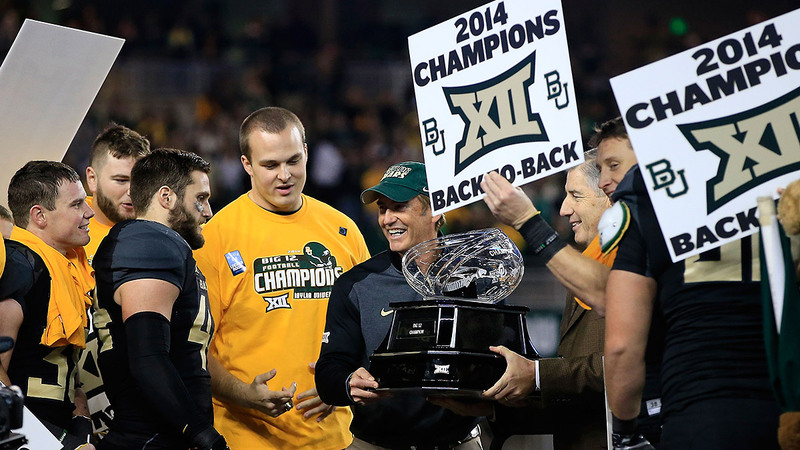 By forcing the Bears to split the title with TCU despite Baylor’s wild, head-to-head win over the Horned Frogs in October, the Big 12 discovered that when you have two champions, you really have none. The purpose of the split, of course, was to increase the conference’s chances of landing a team in the final four by convincing the committee that TCU did, in fact, qualify as the Big 12 champion. At the time, the Horned Frogs had just moved up to no. 3 in the playoff committee’s weekly rankings and looked like much stronger candidates than the Bears, who continued to languish at no. 6; because the committee has an explicit mandate to factor conference championships into its final decision, it made a certain kind of sense for the Big 12 to bolster the Frogs’ chances by ensuring they wouldn’t be punished as runners-up based on the head-to-head tiebreaker. The decision was semantic, but Bowlsby felt sufficiently concerned about TCU’s status to tell ESPN, “It’s not within our prerogative to bind the selection committee” by endorsing Baylor. As it turned out, the self-enforced deadlock only made it that much easier for the committee to punt on the Big 12 question by promoting Ohio State into the top four instead; Baylor and TCU finished fifth and sixth, respectively, confirming suspicions2 that the committee is more willing than the traditional polls to shake up the status quo from week to week in reaction to, say, a double-digit victory over a top-10 opponent. (A few hours before Baylor dispatched K-State, TCU made its final statement by lambasting last-place Iowa State, 55-3, which failed to move the needle.) Had the rest of the conference not hung the Bears out to dry with the conspicuous “cochampion” tag, their résumé might have packed a little extra oomph. Very little, perhaps, but in lieu of a definitive conference championship game to settle the question beyond a shadow of a doubt,3 a little might have been enough. On the other hand, if Baylor would have had enough foresight to upgrade an embarrassing nonconference schedule — as TCU did by adding Minnesota to its underwhelming 2014 slate last spring — then it might have avoided this entire episode with minimal drama. Live and learn, I suppose — and never depend on SMU and Buffalo to hold up as quality wins. Ohio State dominated Wisconsin so thoroughly in every respect that singling out the winning quarterback for high praise is like honoring the tip of an iceberg. On the ground, sophomore tailback Ezekiel Elliott accounted for 220 of the Buckeyes’ 301 yards rushing, a career high. On defense, the Buckeyes forced four turnovers and bottled up the Badgers’ prolific workhorse, Melvin Gordon, who averaged a paltry 2.9 yards per carry with a long gain of 13. On the scoreboard, the 59-0 final marked Wisconsin’s first shutout loss since 1997 and its worst defeat since 1979. All told, this was one of a very small handful of the most impressive outings by a team this season, and the Buckeyes probably wouldn’t be preparing for a January 1 semifinal date against Alabama in the Sugar Bowl if it were anything less. But it was Jones’s performance in particular that made it safe for the committee to tab Ohio State in the absence of its wounded headliners, Miller and Barrett, after the broken ankle Barrett suffered last week against Michigan was cited as a potential obstacle to the playoff even if OSU managed to beat Wisconsin in more pedestrian fashion.4 In his first career start, Jones attempted only 17 passes, and completed only 12, but half of those completions went for gains of at least 20 yards and three went for touchdowns. His passer rating (255.8) easily exceeded career highs by Miller and Barrett, and eclipsed the best rating against Wisconsin during this regular season by a full 80 points. Q: What kind of attack loses two of the most productive quarterbacks in the nation and looks even better with the third-stringer filling in for the biggest game of the year? A: An attack that no opposing defense wants to see looming in the postseason. That said, if there’s any defense capable of dragging Jones back to earth in his second start, Alabama’s is certainly on the short list. The Crimson Tide haven’t been as domineering against the pass this season as they’ve tended to be under Saban, as Auburn proved last week when it lit up the Bama secondary for 456 yards and three touchdowns on nearly 11 yards per attempt. But the Tigers’ starter, Nick Marshall, was making his 25th career start in that game and already had one win over Alabama under his belt from 2013; he also had a pair of oversize, NFL-bound deep threats at his disposal in Sammie Coates and Duke Williams. On Saturday, Missouri’s passing game was nonexistent against Alabama outside of a couple of ad-libbed heaves on broken plays, and Saban (unlike Wisconsin’s coaches) has relevant game film of Jones to draw on. Just a guess, but I bet Bama fans are willing to take those odds. Georgia Tech’s offense followed the doctor’s orders against Florida State pretty much to a tee, monopolizing the ball on four extended, time-consuming touchdown drives in its first five full possessions while FSU’s offense looked on from the bench. Through three quarters, the Yellow Jackets piled up 322 yards rushing while attempting just five passes and boasted more points entering the fourth (28) than all but one of Florida State’s regular-season opponents.5 If you ever played in a vintage triple-option attack in high school, or just appreciate the finer points of its execution against superior talent, you know that the Jackets put on a clinic. Still, even with limited opportunities, Florida State’s offense responded to the challenge by delivering arguably its best game of the year: After punting on their opening possession, the Noles went off for four consecutive touchdowns to close the first half — the first three in response to Georgia Tech scores — and tacked on a trio of key field goals in the second half as the defense began to stanch the bleeding. Jameis Winston, who entered the weekend with more interceptions to his name (17) than any other ACC quarterback after last week’s borderline meltdown against Florida, connected on 21 of 30 passes for 309 yards, three touchdowns, and no picks, good for his best efficiency rating (189.5) of the season. The offense set a season high for yards per play. Which is … encouraging? I don’t know. When Florida State has needed the offense to deliver this season, it has; Saturday’s win was the sixth in which the Noles have allowed at least 26 points but scored at least 30. (Only one regular-season opponent exceeded 17 points during last year’s BCS championship run.) When they haven’t needed much from the offense, it hasn’t given them much, as evidenced by the relatively low-scoring wins over Clemson (17 points in regulation), Boston College (20 points), and Florida (24 points, including a touchdown by the defense). Excluding the dregs of the schedule, FSU has yet to put together a complete game on both sides of the ball. When he’s on, Winston is still capable of matching firepower with any quarterback in the country, which should be obvious, but before Saturday he hadn’t produced a complete game this season; the bulb has flickered on and off for him, rarely remaining lit for more than a quarter or two at a stretch. He’ll be forced to put his best foot forward in the Rose Bowl on January 1, but with Mariota on the other sideline, will that be enough? Obviously, the focus in Pasadena will be on the high-profile quarterbacks, but Friday night’s Pac-12 title game belonged to the Oregon defense, which made a major statement by holding Arizona to its worst offensive output (224 yards) in three years under Rich Rodriguez. 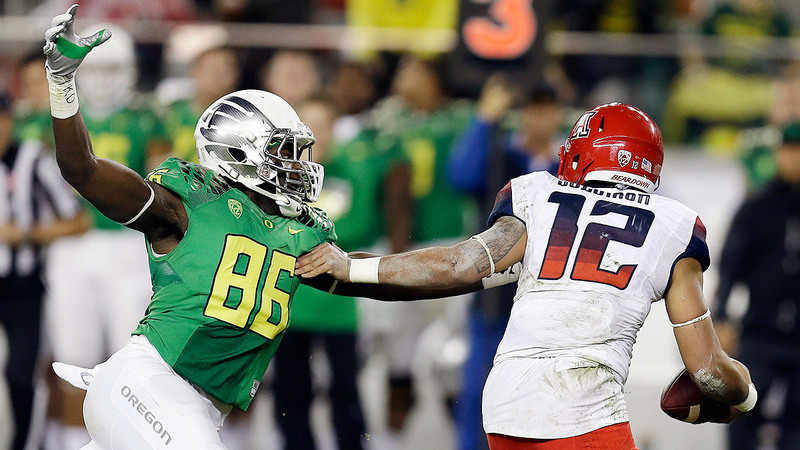 The Ducks forced six consecutive three-and-outs on Zona’s final six possessions of the first half, absolving the Oregon offense for its initial failures in the red zone.6 By the time the Wildcats finally got on the board in the third quarter, Mariota had reached full boil and the rout was on. That’s somewhat out of character for Oregon, which has always achieved most of its superlatives on the other side of the ball. Against FBS opponents this year, the Ducks rank third in the Pac-12 in scoring defense, sixth in total D, and fifth in yards allowed per play — not bad, but nothing to write home about, either, especially given that a far smaller share of that production has come in garbage time than in the past. But this lineup has been around the block (Oregon’s top 11 tacklers are all in their third, fourth, or fifth year in the program), and it’s hitting the postseason on one of its highest notes in years. For this Oregon offense, scoring 51 points is par for the course; now, adding a legitimately dominant effort on defense is a realistic best-case scenario. The odd team out among the preseason favorites is Oklahoma, which opened at no. 4 in the AP poll but doesn’t appear at all this week after blowing a two-touchdown lead Saturday against struggling Oklahoma State. The Sooners also fell out of the selection committee’s Top 25 and forfeited any shot they may have had at landing in one of the lucrative “access” bowls. NCAA rules require 12 schools on the membership rolls before a conference is permitted to stage a championship game; with only 10 teams post-realignment, the Big 12 would have to add more members through expansion or petition the NCAA for a waiver. Barrett’s absence from the lineup may have moved the point spread by as much as two touchdowns in Wisconsin’s favor; the Buckeyes arrived in Indy as four-point underdogs. NC State put up 38 points through three quarters in September. The Ducks crossed the Arizona 25-yard line on four of their first five possessions, but came away with only six points to show for it.